I took a jelly roll pan and lined it with parchment paper. 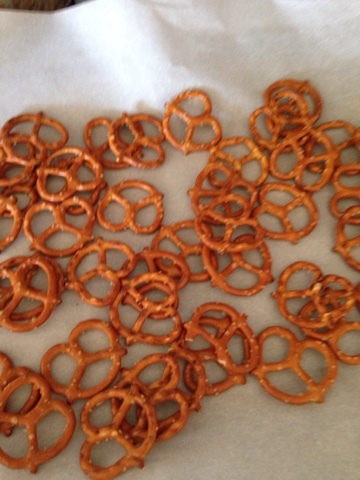 Then I scattered a generous layer of pretzels on the paper. In a glass microwavable bowl I broke chunks of almond bark and microwaved on high in 30 second bursts( stirring in between). Be careful to avoid scorching the almond bark. Once melted I poured it into a sandwich size resealable plastic bag. I sealed the bag and then snipped a small corner section off. See below. 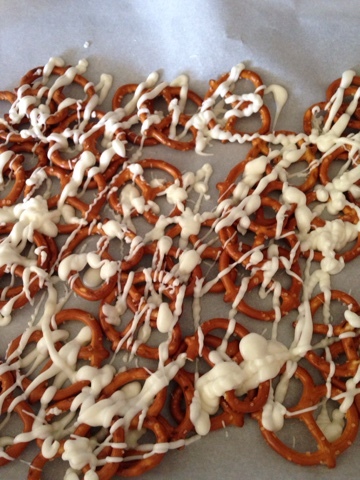 Then came the fun part of drizzling the almond bark over the pretzels. 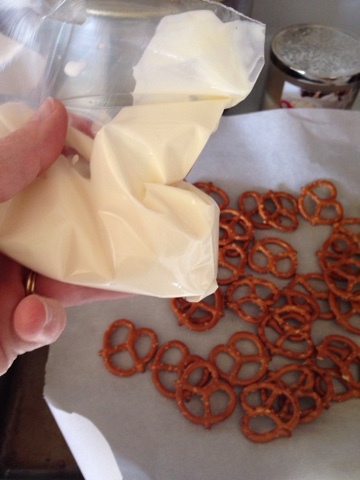 Once the almond bark is cooled you can break the pretzels apart and store in an airtight container. Don"t they look good? Our son is a college freshman and this time of year two things are happening-Christmas and college finals week. The schools send around care packages that you can order but my son is a little bit of a picky eater. Since I am the creative type, I wanted to plan and prep my son's care package myself. The recipe is easy just almond bark and pretzels.